Well, we made it back and boy was it a blast! We stayed on Caye Caulker, at the Iguana Reef Inn. We had a great time and the inn was really nice. My only complaint would be that they're adding a pool (for why I don't know... the ocean is a giant pool itself) and it blocks the ocean view from the bar. It wasn't a huge deal, we just had to hang out at other bars. While we were out, we went snorkeling with Carlos, something I would highly recommend. What made that so good was Carlos' local knowledge... he took us to one spot where a local fisherman happens to clean his catch everyday. As a result, there were so many rays that we had to be careful not to step on one!! We also saw the Mayan site of Lamanai. It's not the biggest Mayan site out there, but it was occupied longer than any other site. Really incredible! While we were there, met a lot of cool people and pretty much had a better time than we could imagine! New gift lists have been added! Let the commercialism commence! Wow, had a great trip hiking with Bryan. We went to Taum Sauk state park in eastern Missouri. The trip was great and one I hope to repeat. We went to the high point of Missouri on Taum Sauk mountain which was not so impressive. What was impressive were the sections of Ozark Trail that we were able to hike. the OT is a very well maintained trail with excellent scenery. We didn't see a lot of trash on the trail so it's either well looked after or attracts a very responsible brand of hiker. 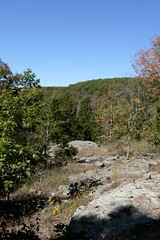 The Bell Mountain wilderness area was also excellent, and for being in Missouri quite rugged. The hike up Bell Mountain from the southern trailhead involves about a 600 foot elevation gain. All in all this was an outstanding trip, I highly reccomend it. Also, click my picture... it links to a flickr set of photos from the trip!